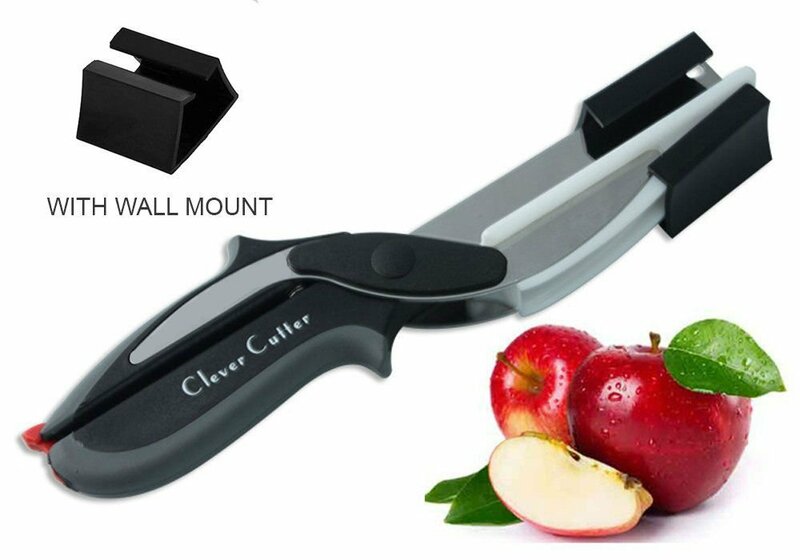 Clever Cutter is going to revolutionize your kitchen with the way it chops through anything in seconds. It's premium design that includes pressure handle with spring enables faster cutting. This is the right time to buy clever cutter. Fruits, meats, vegetables or breads - it's premium blade and wide mouth makes it easier for women to have ultimate experience of kitchen mastery that's fast and mess-free. The blade is made of premium stainless steel and handle is made of A-grade plastic giving you perfect combo of brilliant design, efficiency and effectiveness. Slicing, cutting and chopping is made easier with this great combination of food chopper and cutting board. Clever cutter comes with locking hinge, so you stay safe while not using clever cutter. Clever cutter measures 24.5 cm X 3 cm. Your favorite clever cutter is packed in Kurtzy Brand cover. Please return the product if you receive without brand packing. Beware of FAKE PRODUCTS. Buy RIGHT from KURTZY.